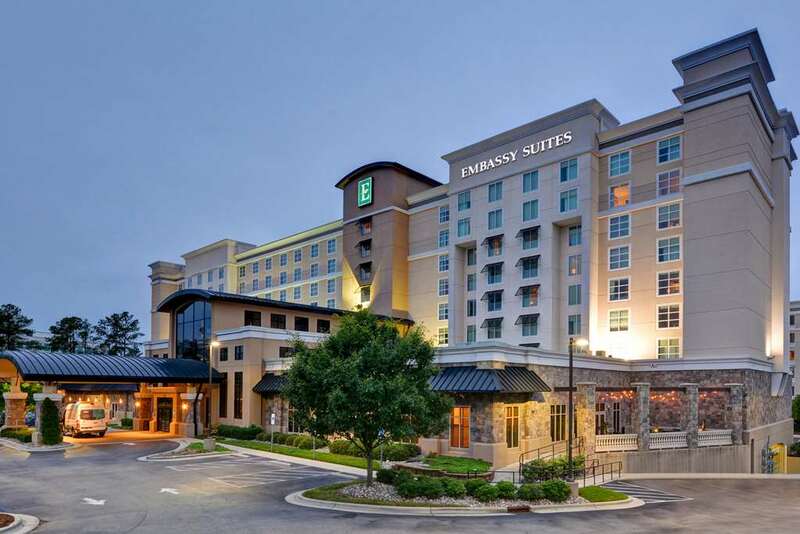 This hotel is 100pct non-smoking The Embassy Suites Raleigh - Durham Airport/ Brier Creek hotel is located in Brier Creek an upscale mixed-use development in North Raleigh along the US 70 - Glenwood Avenue corridor convenient to both Durham and Raleigh mere minutes from Raleigh-Durham International Airport /RDU/ in North Carolina. Research Triangle Park home of many major global corporations and organizations is 10 minutes by quick highway access. Over 100 shops restaurants outdoor cafes and entertainment including those in Brier Creek Commons Alexander Promenade and Brierdale are located within a one-mile radius of the hotel many within walking distance. The hotel provides complimentary shuttle service to and from Raleigh-Durham International Airport and throughout Brier Creek. Downtown Raleigh Durham and Chapel Hill are 20 to 25 minutes via convenient highway access. Many attractions universities and sports venues are nearby our hotel including The Angus Barn 5-diamond steakhouse and long-time Raleigh institution Frankie*s Fun Park RBC Center Carter-Finley Stadium North Carolina State University Duke University University of North Carolina - Chapel Hill NC Museum of Art USA Baseball Training Facility Progress Energy Center for the Performing Arts. Our spectacular hotel features vibrant contemporary transitional decor with all the modern conveniences designed to provide maximum flexibility and comfort for our guests whether traveling for business or leisure. Features of this hotel include A selection of king bed and double queen bed two-room suites with spacious living room and private bedroom. a number of king-bed non-suite rooms. two stunning Presidential suites. All suites have bamboo hardwood floors with area rug in the living room 42* flat panel HDTV complete with connectivity panel for lap top computer and personal electronic devices mini-refrigerator microwave and granite top wet bar. Complimentary cooked-to-order breakfast and nightly Manager*s Reception. Trali Irish Pub: Traditional Irish fare.